Halloween or Hallowe'en, which means "holy evening" or "hallowed evening" is a festival celebrated every year on October 31, the eve of the Western Christian festivities on All Hallows' Day. The festival is also called Allhalloween, All Saints' Eve or All Haloows' Eve. With it commences the tridum (a religious observance that lasts for three days from October 31 to November 2) of Allsaintstide or Allhallowtide. It is a time specifically devoted for the solemn remembrance of the saints, martyrs, and all loyal christians. With days becoming shorter and the air becoming crisper, the excitement of the people knows no bounds in anticipation of the darkest and the eeriest festival of the year. Traditional Halloween activities comprise of bonfires, neighborhood trick-or-treating (a program for fundraising in order to aid UNICEF), costume parties, watching horror movies, visiting haunted places, and several other such freaky activities. Besides these, masks are worn in order to imitate the unholy spirits. Some families and communities carve lanterns out of pumpkins or other vegetables with 'spooky' faces and adorn their homes and lawns in Halloween style. These are traditional ways meant for warding off evil spirits. Also, in other parts of the world such activities as lighting candles on the tomb of the dead and taking part in church rituals still remain famous. Halloween that dates back to 1745 has its origin in christianity and the age-old Celtic festival dubbed as Samhain (pronounced as ''sah-win''). The Samhain festival in Gaelic culture is celebrated at the close of the harvest season. It was a time when ancient pagans used to accumulate the stock for supplies and then used to make preparations for winter. The Gaels had their belief that on October 31, the borderline between this world (the living world) and that world (the world of the dead) would overlap and the dead would return and cause destruction such as spreading disease and ruining crops. 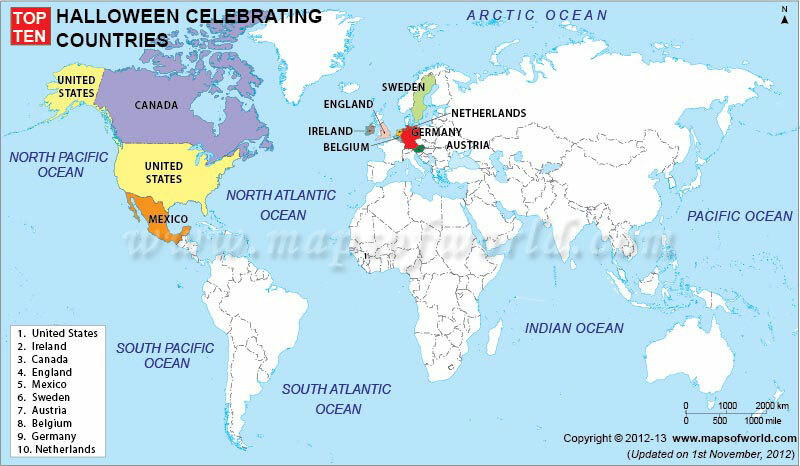 Gradually the history progressed and the activities or the festivities became widespread in the US, Ireland, Canada, England, Mexico, Sweden, Austria, Belgium, Germany, and Netherlands. And, presently these are the top ten Halloween celebrating countries in the world.